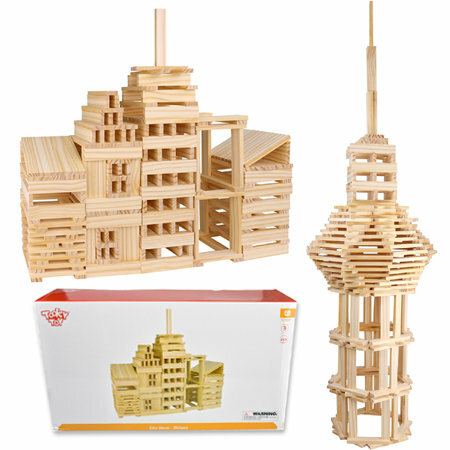 Wooden Building Planks 250 Pieces is a beautiful building set with endless possibilities for creative play and problem solving. The set consists of 250 pieces of wood all of which are the same size. Approx 11.7 cm x 2.34 cm x 0.78 cm. These small thin planks of pine wood can be balanced and stacked in an endless number of ways to create.... well just about whatever you can imagine. Beautiful shapes, spirals, and joints can be achieved and the complexity is entirely up to the builder. From the simplest of forms to towering sky scrapers you can do it all. Size: Box 45cm x 25xm x13cm. Plank size approx 11.7 cm x 2.34 cm x 0.78 cm. We like this because: "A truly creative and thought provoking toy."